(1) Recent chapter updates include: - Ampulla of Vater: Hanni Gulwani, M.D. - Kidney Non Tumor: Nikhil Sangle, M.D. - Liver and intrahepatic bile ducts-Tumor: Deepali Jain, M.D. - Pancreas: Deepali Jain, M.D. - Small Bowel: Hanni Gulwani, M.D. - Stains: Cytokeratin 34betaE12, FLT3 / CD135, HER2, KRAS, MALT1, MelanA / MART1, PAX5, progesterone receptor (PR), S100. (2) In 2012, we reached another milestone, with 4 million visits (about 100 million "hits"), and on 12 December 2012, we had record traffic of 16,994 visits (416,813 "hits"), surpassing the prior record from almost exactly one year prior (on 13 December 2011). Thanks for your support. (3) We are now hosted on a faster, more reliable server. Our host indicated that all 10,000+ files were transferred to the new server, but if you come across a "file not found" error that seems to refer to our website, please let us know. (4) We have now converted about 50% of our 6600 topics to a new format with a separate page per topic, thumbnails of most images and an easier to read format. For some images, we use a "standard" thumbnail if we cannot legally or technically obtain a thumbnail. (5) We have started to add Superpages to chapters as they are updated, beginning with Breast-malignant, and including those listed above. It may take 2 weeks to add the superpages after the chapter update is completed. The Superpages links are at the end of the topical Table of Contents. The Superpages combine all topics in part of the Chapter (usually in 1-3 parts), to make it easier to search between related topics. 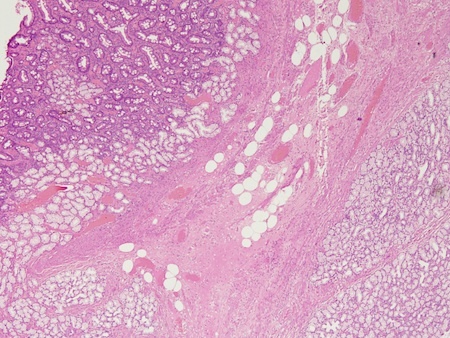 For example, the in situ carcinoma Superpage contains all the in situ topics in one document. We keep each Superpage to a manageable size (< 1 MB) so it loads quickly. (6) Our Feature Page for January highlights Billing / consulting / management, and includes AdvantEdge Healthcare Solutions, APS Medical Billing, Pathology Service Associates, LLC, Vachette Pathology. We also have a new Mystery Case on the right side of the Home Page. 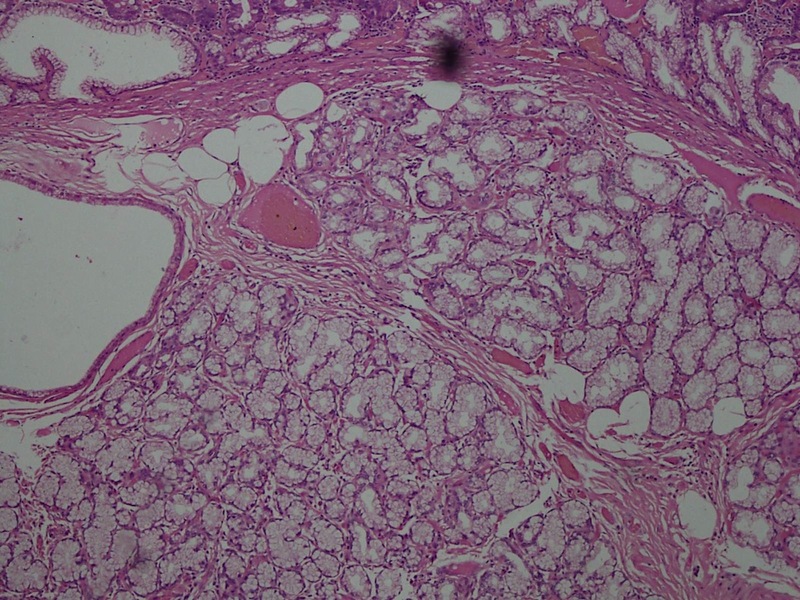 A 53 year old woman presented with a 3 week history of epigastric pain. 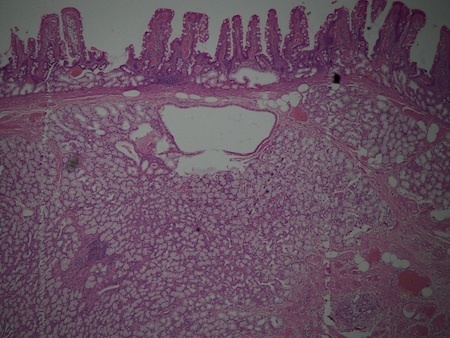 Endoscopsy showed a 1.8 x 1.5 cm pedunculated mass in the proximal duodenum, which was biopsied. 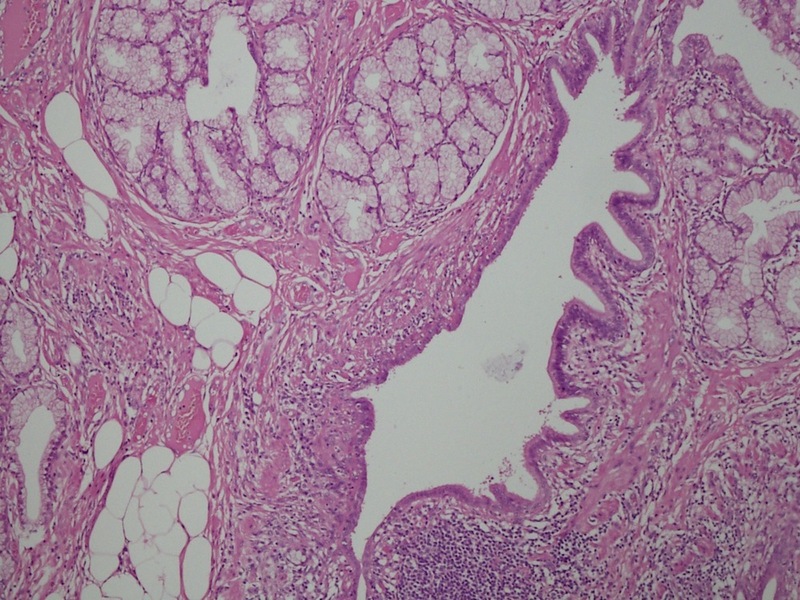 Brunner gland hamartoma, also called Brunner gland adenoma, is a rare benign lesion of the duodenum composed of adipose tissue, hyperplastic Brunner�s glands and cystic ducts lined by ciliated cells (World J Gastroenterol 2004;10:2616). Rare cystic cases have been reported. Most cases (89%) are pedunculated. The cause is unknown, although relationships with chronic pancreatitis, hyperacidity, hyperchlorhydria, H. pylori gastritis (South Med J 2008;101:648) and uremia have been suggested. Symptoms include upper GI hemorrhage and obstruction and less commonly intussusception, biliary obstruction, or pancreatitis (Radiographics 2012;32:213). They also occur as an incidental finding in 2% of gastroscopies, usually in the duodenal bulb. Superficial endoscopic biopsies are often unremarkable because the masses are submucosal. These tumors are benign, and excision is curative.